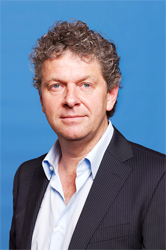 Jacques Monasch is a member of the Dutch House of Representatives for the Dutch Labour Party. Born in Rotterdam, he spent his youth in Drachten, Ethiopia and Tanzania. He studied public administration at the Faculty of Law, specialising in international relations at the University of Groningen. Upon completing his first degree he then undertook a master’s degree in political economy in the economics and government faculties of the University of Essex in England. He then worked for the Scientific Office of the Duch Labour Party, as well as for the American Democratic Party and as an advisor for the ANC in South Africa. He has worked in Russia, the Ukraine, Kyrgizstan, Poland, Georgia, Armenia, Azerbaijan, Croatia, Serbia and Kosovo, advising different political parties, groups, parliamentarians and NGOs. Since 1993, he has held various functions in the national office of the Dutch Labour Party and he led the Labour campaign for the Dutch national elections in 2002.